Has Gold Star father Khizr Khan had his ‘travel privileges’ revoked? Khizr Khan, the father of a US veteran who died in Iraq, and a former target of President Donald Trump’s election attacks has reportedly cancelled an appearance in Canada due to his “travel privileges” being reviewed. CTV News producer Rosa Hwang tweeted that Khan canceled his scheduled speech in Toronto after reportedly being told his “travel privileges are being reviewed” on Sunday. Khan was due to speak at a luncheon in Toronto on Tuesday and, soon after Hwang’s post, Ramsey Talks, the organization arranging the event, posted on its Facebook page, which has 378 Likes, that it would be cancelled. CTV News reached out to Mr. Khan. His response: "I have no comments to make." It isn’t clear from whom Khan received the reported notice of his travel privileges being reviewed, while some on social media have speculated that Ramsey Talks could be misleading the public with its announcement. RT has contacted Ramsey Inc., the company behind Ramsey Talks, for further clarification. CBC reporter John Paul Tasker tweeted to say Khan was also due to appear on The Current show on Tuesday. People have expressed anger that an American citizen could have their travel impeded, with many questioning the fact that US citizens don’t need any sort of “travel privileges” to visit Canada. @igorbobic I read this as the US is refusing to guarantee he would be alllowed back in should he leave. Khan became a target for Trump after he spoke at the Democratic National Convention in July, where he slammed the then controversial presidential candidate for his comments about Muslims and his campaign rhetoric about a Muslim ban. “Donald Trump consistently smears the character of Muslims, he disrespects minorities, women, judges, even his own party leadership,” Khan said. “He wants to build walls and ban us from this country." Trump responded by implying Khan’s wife wasn’t allowed to speak while also tweeting about the Khans. 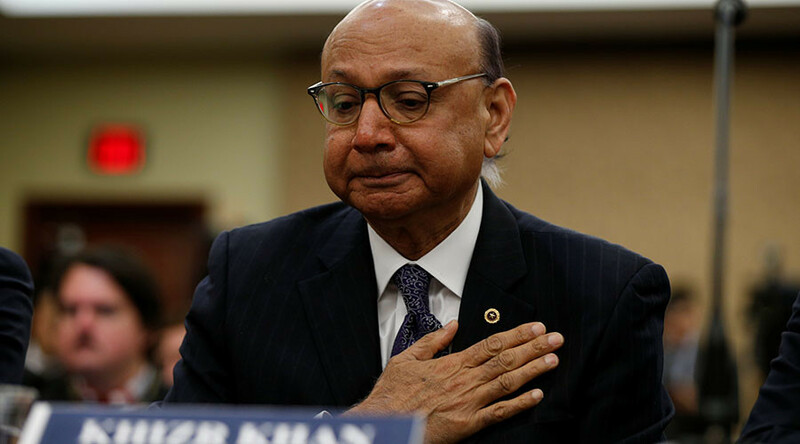 Khan’s son died in Iraq in 2004 and received a purple heart and gold star for his work in the military.